I work with families who are struggling through financial difficulties, health problems, the loss of a spouse to death or divorce, inadequate housing or transportation, recovery following a natural disaster, fire or flood, and many in the midst of personal tragedy or crisis. 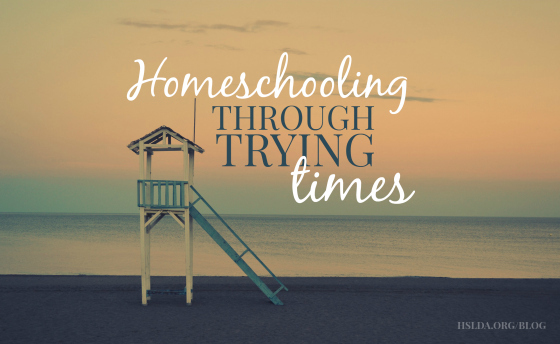 Though they don’t always ask it aloud, each of these families want to know how to carry on, with homeschooling as well as life, in the midst of these situations. A recent crisis in our family has caused me to reevaluate my own reactions in times of trouble. Angered by the situation, I would stew for a few days, unable to even articulate my own thoughts. Stuck holding my breath in anxiety with each swallow tasting like bile, I allowed my own poisonous feelings to make me sicker and less able to assimilate a healthy response. Like a tantrum-throwing toddler, my only prayers during this time were protesting the unfairness of the situation. In the midst of this kind of internal tantrum, my thinking becomes rigid and my hearing becomes dulled. I am thankful that God waits patiently for me to tire of this stuck place and quiet my heart and mind so that He can teach me what it is He wants me to learn through the situation. Sometimes trouble comes and we are ready, shored up in our faith we brave the storm like a house with sandbags at its footing. The water comes hard and fast, but it does not overwhelm the foundation. Other times, we are hit with difficulties of devastating proportions for which there is no preparation. The water hits like a powerful wave, pulling us under momentarily until we can get our breath and footing. Take the one-foot-in-front-of-the-other approach. In the wisdom of Elisabeth Elliot, “just do the next thing”. Whatever it is that is in front of you, do it, and then the next thing and then the next. It takes time to work through difficulties. The processes of grief and recovery and rebuilding have no timeline for completion. Through these times, allow yourself to go at a slower pace. You may need to focus on the bare minimum, ask for help from a friend or family member, or take a break and catch up at a later date. Let the circumstances develop meekness and strengthen your faith. When all of our own efforts come up empty or our security or comfort are shaken, we learn to depend on God in ways we may otherwise take for granted. It isn’t easy, but it is a comfort to know that God is using what we are enduring to draw us closer to Himself. My recent circumstances have given me an opportunity to see places where my character needs refining. As I’ve wrestled against earthly circumstances, God has taught me to rest in the assurance that He is in control and the truth of a situation is never concealed from Him. It is a long, drawn out process for this stubborn soul of mine, but this is developing meekness in me. Maybe you’re a champion of the faith who sails through hard times without flinching. I know a few and their unwavering faith is a beacon of hope to those of us who tend to flail about like someone who can’t swim in shallow water. I am thankful for a Lifeguard that comes to my aide and rescues me from myself. Like a low inspiration: do the next thing! Leave all resultings. Do the next thing! Then as He beckons thee, do the next thing! ← Your One Stop Shop for Pi Day!